Sometimes it's hard to be a fan of a trend when it just doesn't seem like it's meant for your body type. When you're short, you'll find that most regular shirts are way too long. I do love the oversized casual look, but it engulfs my body to a point where I somehow look like a potato sack. Though when I love the pattern of a top that I know I won't fit correctly, I still go ahead and purchase it. My philosophy with clothing is that it can be adaptable to the way you want it. For me that means getting the tuck right, and oversized shirts are all of a sudden my good friends. First, put your shirt on, then your bottoms. Start buttoning or zipping halfway over your shirt to establish the tuck. I know many people like putting on their jeans first, but if they're super tight already, it's harder to tuck. This can also help reduce scrunching at the bottom of your shirt. Second, tuck (or shove) your top as far down as you can into your bottoms all the way around, until it's a tight fit and you can barely move. If you're wearing a skirt, pull the fabric down from underneath. Smooth out the top as much as you can before you completely zip up. Emma Hill does it great here. After you're zipped, buttoned up, or whatever way your pants close, raise your arms as high above as you can. For emphasis, jump up and down a bit. This will help spill enough of the tucked fabric, so it hangs over your bottoms for the perfect casual cool look. For super oversized shirts, try a front tuck. This works great with button ups that might have a bit too much fabric to shove and may look bulky in your jeans. If you tried the method above, untuck the back of your shirt and keep the front tuck a little loose and spilling over. If your shirt has a front and back panel, tuck only the front panel. I love doing the front tuck if I know that I will be layering a jacket over. It hides the untucked back which may seem unflattering at times. To amplify the tuck for a taller silhouette, always pair it with some heels. Mid heels and above work with the tuck to make your legs look like they go for miles. 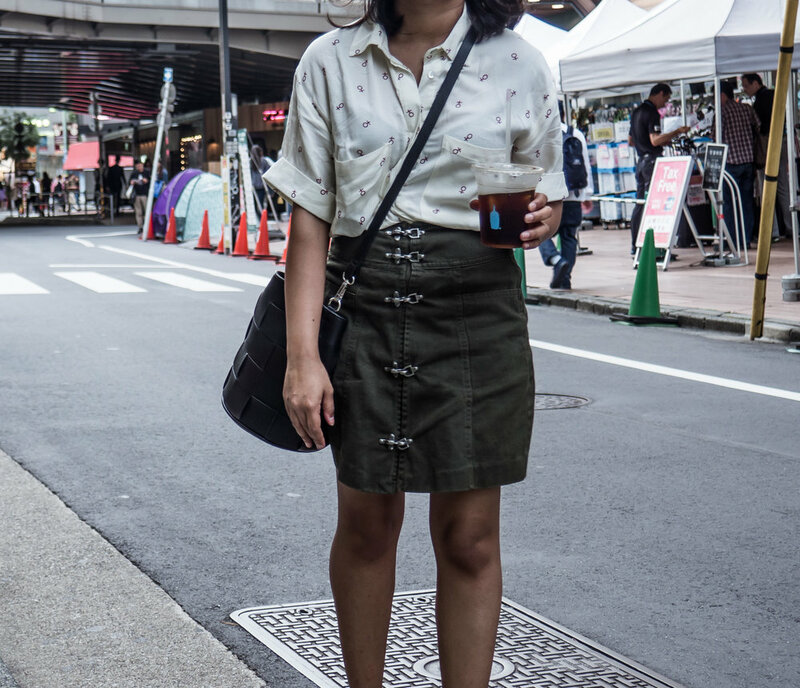 As I finish working my way through my Japan outfits, I stepped out in a high waisted green skirt and my favorite Knot Sisters female-symbol printed shirt. I unfortunately didn't have an iron with me to smooth out some of these wrinkles, which I could have also photoshopped out. A loose tuck gave my waist a little more dimension and made this high-waisted skirt with no stretch look more flattering. Paired with my favorite grommet heeled mules from Sol Sana, gave my easy chic look a little more oomph. 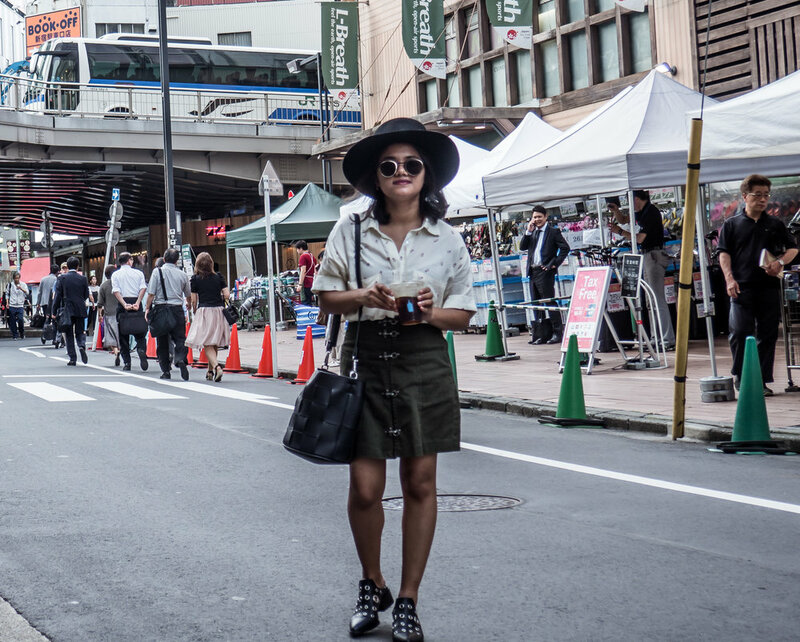 The lightweight fabric and fun colors made for a great daywear outfit in Shinjuku and paired well with the abundance of green billboards in the bustling city.